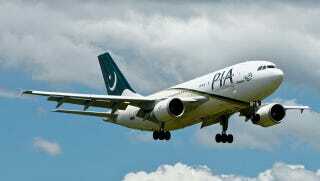 Pakistan International Airlines flight 756 was hit by gunfire as it landed in Peshawar, at the end of a flight from Riyadh, Saudi Arabia on Tuesday. Of the 178 on board the Airbus A310, one female passenger was killed and two crew members on board were injured, as reported by the BBC. "All the passengers were panicked. Some of them wanted to get out as soon as possible because they were afraid of fire inside the plane." The gunmen involved in today's shooting have not been located. On June 9th, Pakistani Taliban members stormed Jinnah International airport in Karachi, leaving forty people dead including the 10 gunmen involved.